The Tornado LX SF-B2729 is one of the newest exercise bikes from Sunny Health & Fitness for 2018. It’s a more affordable alternative to the Schwinn Airdyne Pro or Octane AirdyneX, offering the possibility to perform and monitor HIIT workouts. It’s a heavy-duty trainer, featuring an impressive weight capacity and excellent ergonomics. The bike’s frame features a slightly different construction than the first Tornado bike version, the SF-B2706. It’s heavier, sturdier and equipped with a lifting handle at the rear and an extra bar for the transport wheels. It’s a heavy-duty frame, weighing approx. 98 lbs (44.7 kg). This weight plays an important role in its stability. Plus, both base tubes are equipped with adjustable levelers which allow you to perfectly stabilize the unit on any type of floor. Most parts of the bike’s frame are steel-made, with precision-welded joints. The paint finish is corrosion-resistant and abrasion-resistant. The main color is black, with the Sunny logo painted red, and the Tornado name painted white. For now, these are the only colors available for this bike. The only ABS parts within the bike’s construction are the covers of the chain. The Sunny Tornado LX is not an extremely large fitness machine. However, compared with other upright bikes, it is slightly larger. With the frame fully assembled, it is approx. 56″ (142 cm) long, and 23.5″ (60 cm) wide. It is also recommended to allow at least two feet of clearance around it, for an easy access to the seat, and unhindered operation. Also, its highest point is given by the top of the handlebars, which reach approx. 50″ (127 cm) above floor level. The front fork of the bike is equipped with a set of pegs which can serve as supports for your feet, in case you want to exercise using only the handlebars. This feature is quite a plus, as it can help you diversify your workouts. Other fan bikes, such as the Sunny SF-B2640, or the Marcy NS-1000, do not have it. 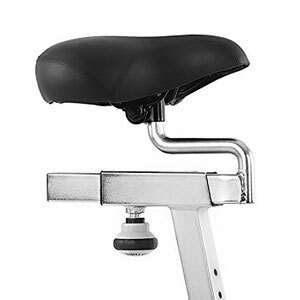 The Sunny Health & Fitness Tornado LX SF-B2729 is equipped with an ergonomic seat, which is considerably larger than for spin bikes. It is approx. 11″ (28 cm) deep, and 11.2″ (29 cm) wide, providing plenty of contact surface. It integrates a thick layer of cushioning, in order to deliver maximum comfort. On the other hand, it features a standard attachment system. This being said, not only that you can slightly tilt it forward or backward, it’s also easy to find a compatible replacement for it, if needed. The seat is 4-way adjustable (backward, forward, up, down). It offers an adjustment span that can fit users with an inseam between 29″ and 41″ (53 – 104 cm). Differently put, it should accommodate comfortably users between 5’0″ and 6’5″ (153 – 196 cm), allowing a complete leg extension. The seat, and the whole frame structure, in general, is durable enough to support users up to 330 lbs (150 kg). The bike’s handlebars are simple bars curved outward and finished with rubberized grips. They don’t have the multi-grips of the Octane AirdyneX, so they pretty much offer only the classic grip. Just as for any other fan bike, the handlebars are mobile and synchronized with the movement of the pedals. They cannot move independently from the pedals, and also cannot be locked to remain stationary while you pedal. In other words, they will move for as long as the flywheel is moving, or for as long as you pedal. The bike’s handlebars are non-adjustable. They’re fairly long, so any user should be able to reach them properly, given the correct seat adjustment. However, you can always add grip extensions to them in order to diversify your hand positioning possibilities. The Sunny Tornado LX SF-B2729 is an air resistance bike, equipped with a large, 25″ (63 cm) diameter fan, situated at the front of the bike. The fan is the one and only resistance-generating element; the bike doesn’t have an extra magnetic resistance system for added resistance. This being said, in order to increase the pedal resistance, and the overall intensity of your workout, you have to pedal and/or move the handlebars faster. The casing of the fan doesn’t have any adjustable dampers. It’s a simple metallic casing, designed to secure the fan. However, it doesn’t completely conceal the fan, giving you the possibility to easily vacuum it if it accumulates dust. Due to the large diameter, the bike generates considerably more resistance than other air bikes, such as the Marcy Air 1 model, for example. Differently put, it offers the possibility to perform high-intensity cardio workouts. The generated resistance is quite different than the resistance generated by a spin bike, with an inertia-enhanced flywheel. It lacks the heavy momentum, and therefore, it’s not the best choice if you also want to improve leg muscle strength. 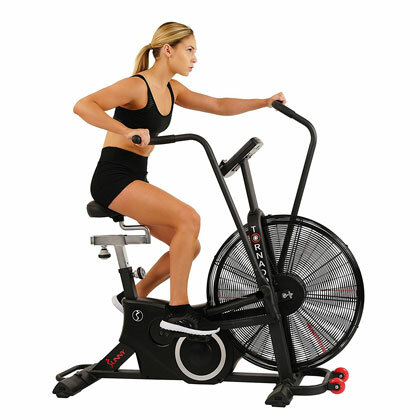 The Sunny Health & Fitness Tornado LX SF-B2729 air bike is equipped with a chain drive system. It uses a standard bike chain. The main advantages of a chain drive are that it can last a lifetime with proper care, and in case it needs replacement, you can basically get one from any bike shop. The main downside of a chain drive is that the chain requires periodic lubrication to prevent it from catching rust or lock links. The bike features a heavy-duty crankset with solid steel crank arms. Its whole crank assembly and the pedals can actually withstand the user in full, standing up pedaling workouts. The pedals don’t have any toe cages or straps, and they also do not have SPD clips for spin shoes. 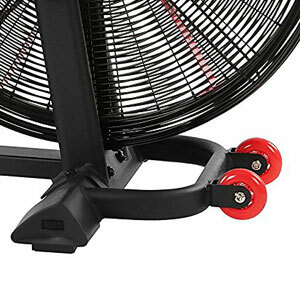 They’re simple pedals, designed to allow the user to quickly remove their feet from them and place them on the support pegs, in order to alternate full workouts with arms-only workouts. They have standards threads (9/16) though, so compatible replacements are widely available. 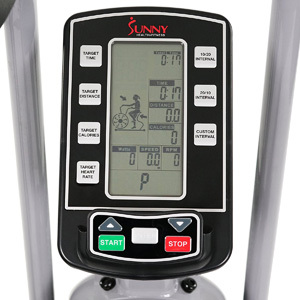 The fitness meter included with the Sunny Tornado LX SF-B2729 is designed for HIIT training. It’s equipped with an LCD display divided into several sub-sections. The display shows time, total time, distance, calories, pulse, watts, speed, and RPMs. The bike does not have any EKG sensors, but the console unit is compatible with Bluetooth HR chest strap transmitters. An HR chest strap transmitter is not included with the bike, though. The console is programmable. It features three main interval programs: 10/20 Interval, 20/10 Interval, and Custom Interval. If you’re new to interval programs, the 10/20 program requires you to intensely exercise for 10 seconds, and rest (or considerably reduce pace) for the next 20 seconds. The console standard program has 8 cycles of Work/Rest, and then it ends. The same goes for the 20/10 program, but in this case, the Work interval is 20 sec. while the Rest is 10 sec. Evidently, the Custom workout gives you the possibility to set up your own timing for the Work/Rest intervals. The console also has four goal programs which allow you to set a target for time, distance, calories, and heart rate. So, when using it in manual mode, the values will go up as you exercise, but if you select a specific target for distance, for example, it will count down from the selected target distance until it reaches 0. The same goes for time and calories. As for heart rate, during your workout, the display will switch between 65% and 85% heart rate. If your heart rate goes below 65% or above 85%, the meter will continue to beep until your heart rate is between 65% and 85%. The console unit is very easy to operate. It has buttons for the Target functions and for each interval program. The arrow keys on the lower part allow you to increase/decrease a value, while the Enter key covers the selection function. The Star/Stop keys allow you to pause and resume your workout without losing your progress. The unit is battery powered. It uses 2 AA batteries, which are included. The core of the bike comes pre-assembled. In other words, the fan, the chain, and the crankset are already attached to the main frame. Thus, for assembly, you will only need to attach the bike’s base bars, the seat, the console mast, the handlebars, and the console. This shouldn’t take more than one hour. All the required tools are included. Also, the manual provides pretty clear assembly instructions. Since it’s a chain-drive bike, the chain requires periodic lubrication. Standard chain oil is the best choice for it. It’s also recommended to periodically check for loose bolts and part, and re-tighten them, if necessary. Not a very quiet machine, but not extremely loud either. 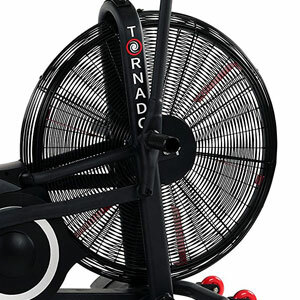 The Sunny Health & Fitness Tornado LX SF-B2729 is an air resistance exercise bike featuring a 25″ fan, and a sturdy frame with a capacity of 330 lbs. It’s equipped with a HIIT, programmable console. It offers superior ergonomics and micro-adjustability. 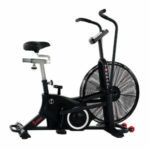 It’s a great bike for high-intensity cardio workouts, interval training, muscle toning, endurance gain, and weight loss. It’s not one of the most affordable air bikes but does offer an excellent value for the price.